Israel’s most important writer and peace activist talks about his early life and influences, his extraordinary process when he writes, and his passionate concern for the uncertain future of his country. 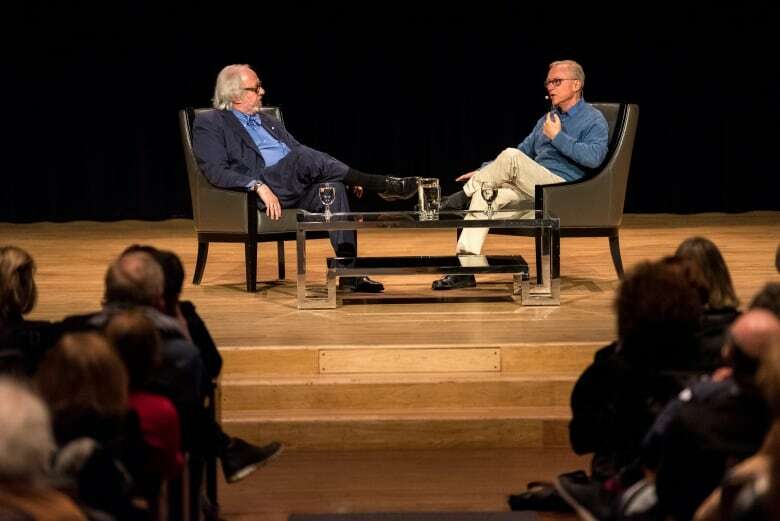 Grossman spoke to Michael in front of an audience at the CBC’s Glenn Gould Studio. On Thursday, he was awarded his country’s highest civilian honour, the 2018 Israel Prize for Literature. Grossman spoke to Michael Enright in front of an audience at the CBC’s Glenn Gould Studio. David Grossman is one of Israel's greatest living writers, and a staunch advocate for peace. His books includeA Horse Walks Into a Bar (which won the 2017 Man Booker International Prize), To The End of the Land, and The Yellow Wind. He spoke to Michael Enright in front of an audience at the CBC's Glenn Gould Studio about his early life and influences, his writing process, and his concern for the uncertain future of his beloved homeland. The event was sponsored by The Koffler Centre of the Arts. On April 19th, he was awarded his country's highest civilian honour, the Israel Prize for Literature. Click 'listen' above to hear the interview. 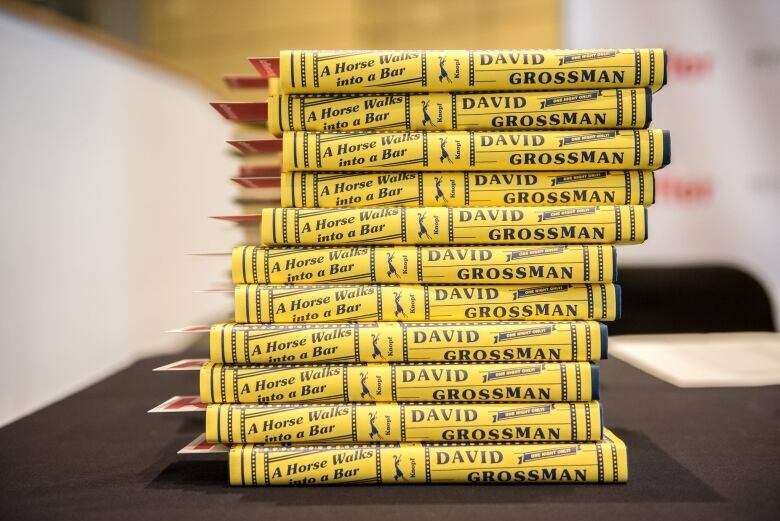 David Grossman's comments have been edited and condensed. I was born in Israel. All my life, I live there. This is the place where I want to be. All my activity, out of literature, is to make this place a real home. Home — it means a place where you feel totally comfortable, and where all the rooms are yours. The rooms that are not yours, you know that they are not yours, that you have settled your relationship with your neighbours, and that you will see their sequence of children and grandchildren. I think the deep definition of the Jew as a individual, and as a collective, throughout our history, was of someone who never really felt at home in the world. We never really had a place that was like home, except for some periods in the long past. And Israel is meant to be this home. It's a home that is worth fighting for. I think the tragedy is that even though we are celebrating — and it's really a reason to celebrate, the 70th anniversary of Israel — still it is not a real home. It is more like a fortress, but I don't want to live in a fortress. I want to live in a home. Each time we tell a story to someone, there is a second chance. We can understand it in a new way, we can be in the situation in a new way. We have the official story of our life. Each one of us has a story that tells about our childhood, about how our parents treated or mistreated us, about our siblings, what they did to us, our friends at schools, the teachers, all that. And over the years, we learn to polish our biography. We know how to tell it in the best way, that will buy us the sympathy or the empathy or even the love of those who listen to us at first meeting. But maybe, at a certain age, we can look at our formal stories, our legislative private myths. And we might discover that they are no longer relevant to us, that we are already in another place in our life and we do not have to collaborate with these stories that are out of time already. We have become not only prisoners of these stories, but also the victims of these stories, because they block the air to us. But if you allow yourself to massage this formal story ... maybe you will find out that you are able to be, for example, more forgiving to your parents. You might allow your parents to have a psychology also. They also deserve to have their psychology. And then, suddenly, you move freely within your own life. 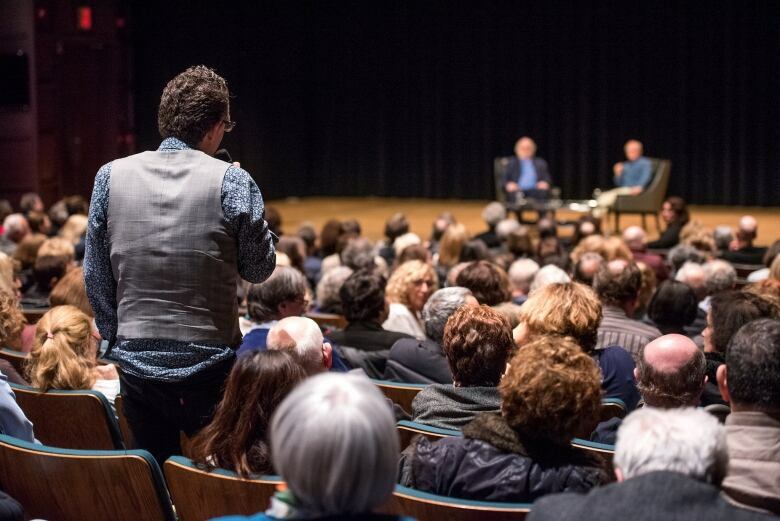 Author David Grossman takes questions from the audience in the Glenn Gould Studio. When I write a novel, when I write non-fiction, when I write articles about the conflict, I try to massage the narrative of both Israelis and Palestinians. In five days, I will take part in an event in the heart of Tel Aviv. There is an organization that is called the Forum of Israeli and Palestinian Bereaved Families. People who lost their dear ones in wars, in terror attacks, people who fought against each other and understood at a certain point that the war cannot be won, and that if they just surrender to the magic of hatred and vengeance, they will just perpetuate this vicious circle. So they decided to act in another way. They have what they call an alternative memorial ceremony, which arouses — you cannot imagine — such rage and hatred towards us, towards this group. I think that to be there, to look at the Palestinians, to hear that there are Palestinians who think differently, who really want peace … We are not talking about love. It's not a love story between two peoples. In the end, we shall not walk hand in hand towards the sunset. But it can be a very sober, rational agreement between two peoples who have suffered so much and decided to change their destiny, in a very courageous way. Now, Minister of Defence Lieberman forbids permits to the 120 Palestinians who are supposed to come. He refuses to allow them to come, saying that their coming is a sign of bad taste and lack of sensitivity to the bereaved Israeli families. But we are the bereaved Israeli families. I think that to be there, at that evening, hopefully to see them face to face — if not, on television, video conference — this will be, again, to massage the narrative and remember that we are not only products of the conflict. We have our liberty to shape it in another way. Israel's top court overruled Minister Lieberman's decision and allowed Palestinians to attend the ceremony. David Grossman delivered a speech to a crowd of approximately 6,800 people. You can find the full text of that speech here. 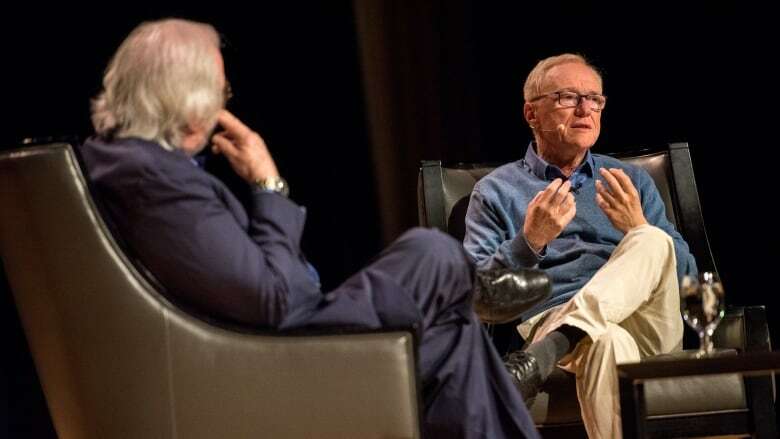 Click 'listen' above to hear Michael Enright's conversation with David Grossman, recorded in front of an audience at the Glenn Gould Studio, at an event sponsored by The Koffler Centre of the Arts.